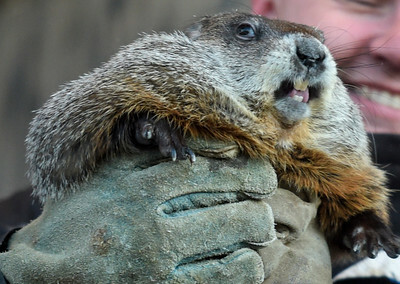 Willie the groundhog is pulled from his tree nest and presented to the crowd on Groundhog Day, February 2, 2017, in Woodstock, Illinois. Just as in the movie a polka band played before presenting Willie. 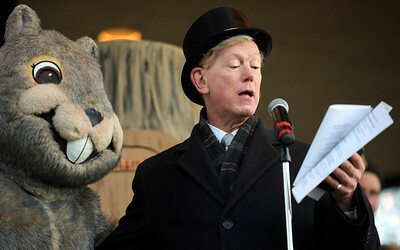 Woodstock Willie proclaims to Woodstock Mayor Dr. Brian Sager that he has seen his shadow on Groundhog Day, February 2, 2017, in Woodstock. 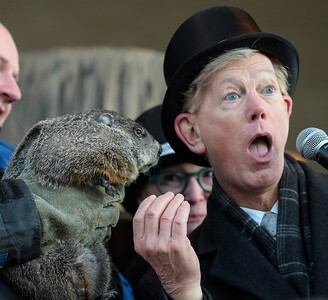 This proclamation means there will be 6 more weeks of winter. 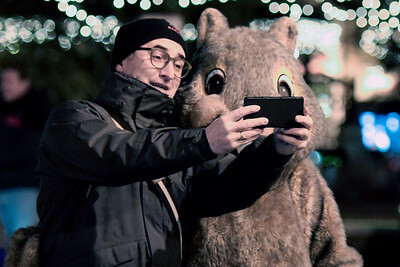 Hubert Michl(cq) of Munich, Germany, takes a selfie with Woodstock Willie the mascot, before the annual Groundhog Day festivities begin February 2, 2017, in Woodstock. Michl loves Groundhog Day the movie and made sure to schedule his meetings this week so he could fly in from Germany to conduct business and make a trip out to Woodstock. 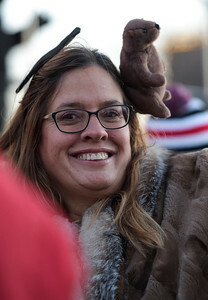 Susan Luciu (cq) of Glenview, livestreams Groundhog Day festivities on Facebook , February 2, 2017 in Woodstock, IL. 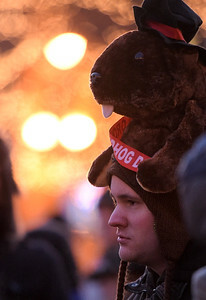 This was Luciu's first time attending the event with a friend, who made her Groundhog's day headband. Woodstock Mayor Dr. Brian Sager sings with Woodstock Willie the mascot February 2, 2017, in Woodstock. The Groundhog Day movie was filmed in Woodstock in 1992. Jake Reich, of Union, stands in front of the bandstand in Woodstock, Illinois, to see Woodstock Willie emerge from a tree trunk on February 2, 2017. It was 15 degrees outside with a windchill of zero degrees according to the national weather service.